So last week was banned books week! I recorded a few videos on the topic for my facebook page, and ranted about a few different books and the basis on which they were banned. Needless to say, I was incensed. The books I chose were banned often on the basis of religious difference, and I always found that sort of…ya know, counter-intuitive, considering how the US was founded on the idea of religious freedom. Yep. So winding down banned books week was interesting! One of my favorite posts I read was by a long-time favorite author, Diane Duane. At the end of banned books week, she found out her book had been banned in Texas! Oh, the timing. SO perfect. 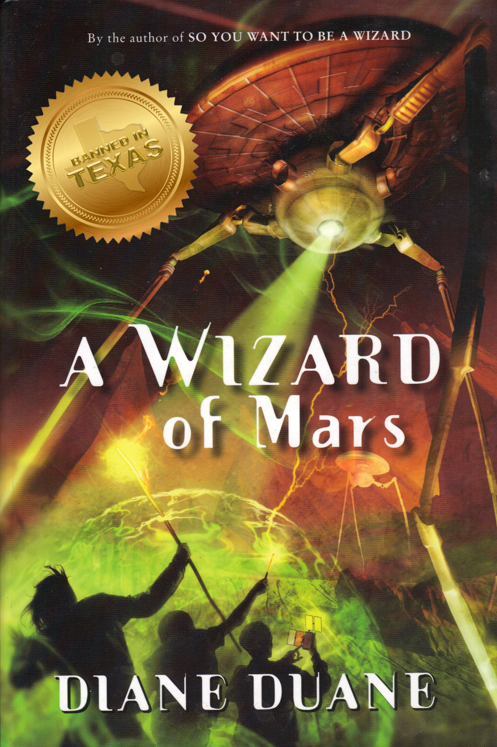 The 9th book in her Young Wizards series was banned on account of violence and horror. Yyeahhh. Of course it was. I harped on this a lot during banned books week with my videos, but I think it’s especially important to write about here — you never really know which book you’re going to pick up and read that will change the way you look at life — or frame your world-view. And yet, across the country, people are banning books from being widely available to children due to their own belief systems. I’ve personally always been a voracious reader. When I was a kid, it was always like pulling teeth to get me to do much else. I read books like The Hobbit, the Young Wizards series, and Harry Potter. Why? Because each book, with a world of its own written in between the covers, helped me frame the world I lived in. It helped me, in the long run, become who I am today. I can’t fathom why people would take that opportunity from young people on purpose. I feel like the world is a better place with more readers in it. I think that…well, it’s important, especially in a world where writing and reading are taking second place to things like television, video games and movies, to read as widely and as much as possible. The more people find reason to ban books, the less likely it will be that young people start to read what they love — especially if books required by common core in schools are not to their liking. Books teach kids how to be empathetic. They teach kids how to be imaginative in a world where everyone seems to be striving to be “normal,” whatever that’s supposed to mean. Maybe that means books teach kids to be writers. That’s kind of what happened to me. Banned Books Week celebrated that which is deemed inappropriate for — often times — very selfish reasons, and basically invites the entire world to rage against that. So — good folks — rage. Read as many banned books as you possibly can. Read them, and then pass them on to people who might need them. Worthy of repetition — you never know which book you’ll pick up that will change the way you live your life. So go forth, and turn pages. I absolutely love Diane Duane and to see that one of her amazing books has been banned is ridiculous. Of all the books that could be banned this is the least violent. Also, thank you for writing about her. I had no idea she was continuing the series. I now have a new book to purchase!